How to Save Money on LEGO So You Can Buy More Bricks! We are going to teach you to how to save money on LEGO. It really is possible to save a lot! Kids asking for another expensive LEGO set? There is no doubt LEGO can cost you an arm and a leg and the prices just went up again. No worries, we are here to help you. The key is making sure you are getting the best deal possible when you buy. That way you can make your kids (or yourself!) happy without breaking the bank. We are big LEGO fans and purchase a few a LOT of bricks. If everyone in your family is always asking for more LEGO believe me, I know how it is. I’ve got you covered. Today I gathered my tips into one place and am happy to share them with you. I’m spilling it all because I want to try to help you save money on LEGO too. Check out the tips and go forth and score cheap LEGO like the ninja shopper you are! I am frugal. My goal is to get sets for close to 1/2 off retail. Not easy! I do not like to pay more for something than I have to–I really, really hate that! I am a sale watcher, coupon/coupon code user, and I know my prices because I am determined to get good deals. Yup, I’m pretty into it. I will share some tips that really work. Before we get started you need to check out the buying guide below. Then we will cover specific stores. There isn’t one best place to save–bummer eh? You HAVE to shop around. But if you follow these tips you will save. 1. Always know retail prices. One of the best ways to save money on LEGO is to go to The LEGO Store, and jot down the actual retail price of the items you are interested in. 2. Know that sets are available for a limited time. After that time passes you will pay a premium price, so if you need a specific set, don’t wait until the last minute. 3. Pass by the first sale on new sets. They get cheaper down the road. Of course, if your child really wants the set and you know you are not going to be able to wait then watch for the sale that happens soon after they come out and snag it. 4. Christmas shopping? Buy ahead! I was in Target a week before Christmas last year and there were only a handful of sets left. People do clear the shelves close to Christmas and you won’t find the most popular sets. Find your sale early and go for it. 6. Use Camel Camel Camel (see Amazon below) to scope out the lowest price seen on a specific set. Jot it down. This gives you something to shoot for. 7. Bonus Idea for you: Follow me on Facebook. I post the best deals I find, plus other awesomeness. While I post deals all year round, I really ramp things up at Black Friday, Cyber Monday and through the Christmas season. * I was reading a deal site not long ago and someone said that Amazon was a terrible place to buy LEGO. What?! That is oh so wrong. Maybe they are novice deal seeker. I have bought some very cheap sets on LEGO. You just need to know what to look for and what to do. * Amazon will sometimes put the retail price of sets higher than the actual suggested retail price and then slash through that price and call it a deal. No deal! You have to know retail prices before shopping Amazon but you can find cheap LEGO sets there for sure. * Use Camel Camel Camel price checker and tracker. Get a line on the price history of an item on Amazon and know if now is a good time to buy. Don’t forget to set it to track a price as well. * Deal of the Day offers 2 items on a special sale. Deals on sets and bricks come around once in a great while. I watch for it and will post it on FB as soon as I see it. * Use Amazon Prime’s slick feature that allows you to shop deals 1/2 hour early (totally worth it on a hot item like this!) I have a special offer for you: Try Amazon Prime 30-Day Free Trial . Try it free for 30 days. If you don’t like it, cancel before the membership ends and you own nothing. We love our prime membership. * Clearance deals can be worth a look. << I linked to clearance for you because it can be hard to find. * Walmart can have good LEGO deals but you have to watch for them. They had an incredible deal on a bucket recently (we bought 2) and I posted it on FB. It sold out fast but those who were able to get it were very happy. Very happy!! Yay for cheap LEGO! * Shop Walmart at the holidays. They have bundles. For example, they will put together 3 Star Wars (or other) sets and offer them bundled at a reduced price. I have not seen anyone else do this on a regular basis. * Watch for the DUPLO and LEGO bucket sales during Black Friday sales. You can order online if you aren’t into Black Friday shopping (but it is very fun ;)) Buckets are a great way to add to your basic brick collection. The price per piece on these bucket deals are incredible. Cheaper than buying them used! * Walmart clearance. Know your prices and make sure you are really getting a deal. When they just mark them down the prices are not necessarily that great. But . . . if you are patient, you can score great deals. * Walmart does price match with online stores but not with Walmart.com – odd eh? * This is hit or miss but I have gotten a decent deal here a couple of times. * B&N does occasionally have coupons/and or coupon codes for 30% off toys. So if you need a set and are not seeing a deal elsewhere, that 30% coupon is a great thing to watch for. * The thing I like about B&N is that they tend to have unusual sets that you are not going to find in other stores or on Amazon. * Aldi usually has small sets around the holidays. I watch but don’t often buy here as it is not usually something we want. But then, we have a lot of LEGO already so if you are looking for small stocking stuffer sets this may be a good bet. * Black Friday at Target rocks the LEGO deals. It does depend on what you are looking for but they always have a great sale and I always check to see if they have what we need. * Watch for Target’s November coupon book. It often has LEGO coupons in it. Yay! Wait and pair that with a sale for a good deal. * Check Target Cartwheel for additional, though rare, deals. * Clearance at Target goes fast! You have to watch and check back often if there is something marked down that you want. The pricing markdown amounts go 15% – 30% – 50% – 70% – 90%. I have never been lucky enough to find sets at 90% but I did find a few at 70% over the years. NINJA BONUS TIP: Target’s markdown schedule for toys is on Wednesdays. * Price match at Target is easy and they are always awesome about it. I price match there often. * Target runs regular sales on sets. When I know we want something I watch the ads and wait until the price is right. I also check online because they have different sets than my local stores do. * Check online. They have additional sets and sometimes run sales not seen in stores. Use your Target Red Card and get an extra 5% off and free shipping online. Savings on top of savings. I love that! * If you live near a LEGO store (and may I just say LUCKY you!) hit their free builds each month. They offer a totally free mini set that you can build and take home. Free Bricks – how awesome! * We L. O. V. E. the Pick-A-Brick wall. Purchase a small or large cup and fill it above the rim with bricks and elements. Pack wisely – you can get a lot into these cups. We tend to go for the unusual colored bricks (like orange,) and a whole lot of small pieces. * They have a small clearance section that you should check each time you shop – you never know! * The stores and online shop have a nice VIP program where you can earn points and get a $5.00 credit for each $100.00 you spend. It is worth signing up for it. As you know, it all adds up. Become a LEGO VIP for free now. * If you don’t live near a store (unfortunately, we don’t,) the online Pick-a-Brick wall can be a great place to pick up pieces. They do cost a bit more per piece this way as opposed to getting the cup in the store but they have a decent selection of pieces and you get what you want. We like the minifig pieces you can buy (heads, bodies, legs, accessories) to construct your own minifigs. * The LEGO Shop Online often has a free item with purchases of over $50.00. I have seen a neat tractor, a Spiderman jumper etc. We love free. * Get free shipping with orders over $75.00 (update – they now ship free with orders over $35.00!) and a free shipping deal for any size order will usually occur around Black Friday. As I said, I am frugal. Everyone who knows me well will agree. I am also very good at finding deals. Here are my secret weapons that used together help me to get LEGO at a discount. I can always get a good deal on the sets we want. It just takes time and a bit of effort. * Know the retail prices. * Use Camel Camel Camel to see what the bottom price is so far. * Check Deal News or Slick Deals to see if the set I want is listed and check this occasionally. * Rely partly on past experience and knowing what a good price is, which comes with buying way too much LEGO! * Shop all of the stores online and check which stores have stock on the items I want need. * Wait. I check stores and sites occasionally and watch for sales, coupons, deals etc to see if I can find cheap LEGO sets. Then I wait. Sometimes for quite a while before I find my buy price. * Before buying I check for in store coupons, online codes, and/or check Ebates to see if I can get an additional amount off. * Combine discounts. For example, if I have a $5.00 off $50.00 from Target I will likely end up focusing on matching a sale with the coupon and my Red Card discount. Or I will combine an online sale with Ebates, and if possible, another coupon code. * I always check clearance when I am in the stores. I have gotten the very best deals this way. I walk around each store I am in so I am hitting all the back end caps in the toy section so I can watch to see what is on clearance. Of course, I also buy used LEGO because you can never have too many bricks! See our article on saving on used LEGO for tips on buying used bricks, sets, minifigs and more. Sign up for our newsletter if you don’t want to miss it. 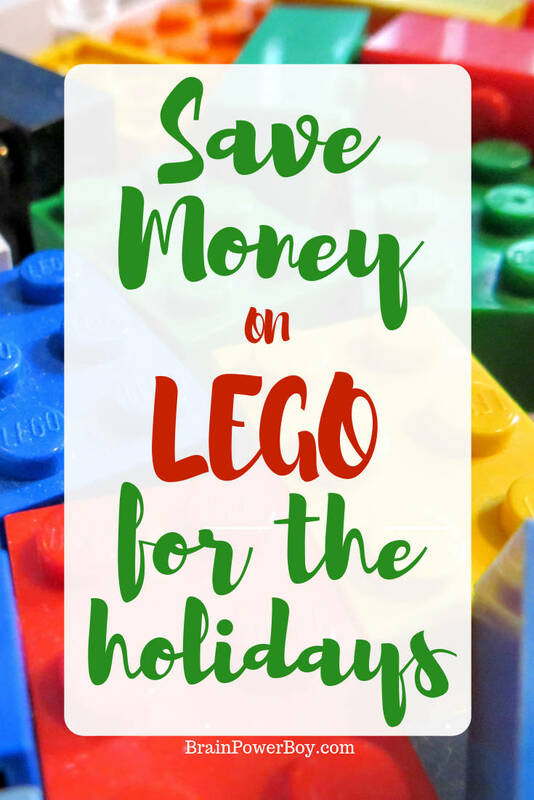 I hope this helps you save money on LEGO and be able to buy more without emptying your wallet. I never buy at retail prices and have saved a LOT of money over the years using these techniques. If you want to take the easy way out, simply follow me on FB as I will be posting deals when I find them. Either way, now you have all the information you need to grab good deals. Go forth and save! If you made it all the way to the end of this article, then you must love LEGO as much as we do! Be sure to check out our Ultimate LEGO Gift Guide for some wonderful must have goodies! You just made my year!!! My youngest has started asking for sets that are just his (he inherited big brother’s LEGO) and I was a little alarmed at the price of some of these sets. I can’t wait to use your tips to get a jump start on Christmas shopping. Thank you for including the links too. Bookmarking for future reference and sharing with everyone I know!! It is always nice to hear from you and thanks for saying I made your year lol. Good luck with your shopping. Start looking now for the sets he is interested in to be sure to score a good deal. Thank you for sharing this with others – that means a lot to me. Great advice, I’m wondering whether we have some of these things here in UK like the pick a brick wall. My kids are just getting into wanting so many more Lego sets, so I need to learn these ninja skills to get the best prices. Big agreement with knowing retail prices, and holding out for 40%+-off deals that tend to come up eventually. If you’re buying new locally and can return the item, lean towards buying it even if you’re not sure it’s a great deal. Keep it sealed and think it over for a few weeks and if you decide it was a poor deal or find an even better one, return it for a full refund. Buying new gives benefits like this, so take advantage of them. I’ve only done this once or twice, out of tons of purchases, but it’s been the deciding factor in going ahead with a purchase rather than holding off. Amazon’s automated equipment regularly damages the boxes for items, and they discount them (they list as used but describe exactly how they differ from new). Go to Amazon Warehouse Deals, search for LEGO, and possibly find some better deals. I’ve bought a few and the box damage was really minor, so I’ve been pleased. Stores with higher prices (like Toys “R” Us) have the benefit of keeping sets in stock longer after they’ve been discontinued, since people clear out the lower-priced places faster. This might allow getting a missed set for cheaper than the inflated retirement price in the marketplace. Thanks for the comment. I agree you should scoop up a deal and can hold it to see if something better comes up. I have not found any good deals in the Warehouse Deals section of Amazon but I am glad to hear you have. I only get “used” items from other sellers that come up when I search LEGO. I’ll have to check more regularly and if I find that it works, I will add it to the list. So far – no luck for us on that one. Thanks again for your tips! I’ve been buying mines used because they are not in my budget. I will try out Amazon and I didn’t know they had coupons. They are expensive no doubt. Be sure to watch for our Saving on LEGO Used edition. You just might pick up a few tips. I do like Amazon for some good deals 🙂 Enjoy shopping! Facebook yard sale groups sometimes have people selling loads of Legos for cheap. These are great ideas. We haven’t reached a “must-have-Legos” stage yet, but I think we’re coming to one! We are about an hour from the Lego store and we LOVE it! I always head to the clearance section. I love too when I have earned points to get a discount! Great tips here, thanks for sharing with us! Holy Moly! What a fantastic resource! You seriously just made my Lego year! I was captivated by all your advice! Thanks for this! Thanks for the Holy Moly! Erica lol You made my day. I’m glad you found some ideas to help you save. We have a couple of Lego junkies out our house – even my daughter loves them since they added the girlie sets. Great ideas! My tip would be to just keep your eyes open and buy ahead of time if you spot something. My son found a Lego set in the clearance section at Target while we were looking for a birthday gift for a friend and knowing it was a good deal we bought it on the spot. He might remember that we bought him a Lego set, but by the time Christmas or his birthday rolls around he won’t remember which set it was and be totally surprised. I am co-hosting the #HomeMattersParty link party this month and would love to have you stop by for a visit. The door is open now through Monday night. We buy ahead too. When I find something on clearance I stick it in a closet to save for birthday and Christmas gifts. Neat that your son doesn’t remember which one you bought so he can be surprised! Thanks for the linky invite. I popped over to share this post. Great tips! I like to put the sets my son wants in his wishlist, then check it every once in a while. If the price has gone down, it will say what percentage off it is from the time you put it on your wishlist. I get them for 30% off all the time! Thanks Vineta! I have not used the wishlist feature before but will have to try that. I love that is shows a percentage off. BTW – good job scoring a consistent 30% off. The best deal I ever found on LEGO was at the homeschooling buying co-op. Huge education bins for $20. I grabbed a bunch of different bins but never saw a deal like that again. Disappointing, but perhaps it’s a good thing or I’d need a whole room just to store LEGO 😉 . And I remember one year visiting Downtown Disney in Florida and discovering the LEGO store for the first time. I spent 4 hours in it. The cup you fill, I filled like a mathematician, absolutely no space was wasted. Again probably a good thing I don’t live near a LEGO store. Oh how lucky you were to get those bins for $20.00! I know what you mean about the cups. That is how we fill them too lol. Thanks for the comment! Such a great post! I didn’t know about CamelCamelCamel. Thank you!!! I live very close to a Kroger grocery store and I have been so surprised to score some GREAT sets on clearance. I keep up with the retail prices and grab them up and hold onto them for gifts. Thanks so much for the tip. We don’t live near a Kroger so I had no idea they had a good clearance section. I’m sure your comment will help another reader out! You just never know where you are going to find LEGO sets 🙂 Thanks again. We live near a Lego store, and on occasion they also have scratch and dent sets, for about 15% off, but you have to ask for them. Thanks for that tip Rachel! I didn’t know about that and really appreciate you sharing it with everyone. Our nearly 4 year old daughter LOVES Legos and in just a few brief months, we’ve spent… Well, we’ve spent A LOT trying to make sure we’re fostering this newly found love. I am bookmarking, pinning, and I might just even print this list so I wanted to say, thank you. Thank you for sharing this with us and linking up at the #SHINEBlogHop – that’s how I found your site! Thank you so much for your nice note 🙂 I am so happy that you enjoyed the post. I’m happy to link up at SHINE – fun indeed. I will be watching those prices this holiday season. I have to admit I did buy the Frozen castle when I found it the other day because it was the first time I’d seen it anywhere near us, and I know it will be hard to find at Christmas time. But, the rest? I am waiting for a deal! Yay for deals Christina. If it is something that your child really, really wants and you don’t think you can get it on sale I would totally buy it. I usually then start really hunting to see if I can find a better price – you never know until you try. Glad you found some ideas here to help you find deals – good luck! This is so amazing! LEGOS are the only things that keep my kids playing together for hours. I recently found a sale on Amazon and knew there had to be other ways to find discounted LEGO sets. I found this post just in time. Thank you for sharing your ninja moves!!! I’m so glad you like it Diona. More than happy to share! We have definitely spent a small fortune on LEGOS! My kid strongly believe, You can NEVER have enough of them! You list many places that I didn’t even think about checking! Thanks for ideas! Yes, I’ve had a good amount of cash go toward LEGO as well lol. I’m so glad you found some new places to buy. You are most welcome for the ideas. My pleasure! LEGO sets change over two times a year — in August and in January. This is the time to shop Walmart clearance, as anything they are discontinuing ends up here at significantly reduced prices. Ask your Walmart Toy Department Manager when the Fall and Spring resets are and GO the day after they switch over the shelves! Thanks for the additional tip. I have not had very much luck at all with Walmart clearance but I do know that this varies by store. Our Walmart marks the sets down a little bit and then they sit and sit without any additional markdowns. I’m glad to know that others are finding deals there so I appreciate you taking the time to comment. We love Lego – there are some great tips here – we have brick that have been passed down our family and I have a huge box that will go in the loft once the youngest has finished playing with it! Thank you for joining in with the Frugal Family Linky. I an an occupational therapist and I work in a school for kiss with special needs. I love using Legos for fine motor, matching, and assembly tasks. I want to start a social skills group involving Legos, having each child be in charge of a certain color and they need to ask each other for bricks and learn sharing and turn taking. I am so glad I saw your post and I will be signing up for your newsletter so I can find used bricks! Thanks for sharing your tips! How nice of you to leave a comment. Thanks for stopping by and signing up for the newsletter. I hope to see you back soon. Great post! My son loves Lego and I love getting it for him as it’s such a creative toy but I hate paying full price for it! It’s so expensive! I tend to buy in advance of his birthday and christmas and buy I when it’s on sale. Fortunately he’s still young enough not to care whether it’s the very latest set and has been really happy when I’ve given him sets that are about to retire and being sold off cheaply. I do try and encourage him to look after his sets and take care not to lose pieces as because it’s so popular I retains some retail value. I also try and keep all the boxes and instructions just in case he ever wants to sell them.